Rainforest Rapids Bounce House & Inflatable Acworth, GA - Rent Today! Our best-selling Rainforest Rapids is the ultimate combo jumper! The centerpiece of this party jungle is the Zulu bouncer, an 8 x 8 jumping paradise, which is combined with the cliffs of Zulu which leads to the entrance of the dual mega water slides and allows you to escape into the Tiki Lagoon. Sprayers rain down from above on both of the dual water slides, creating the rapids. 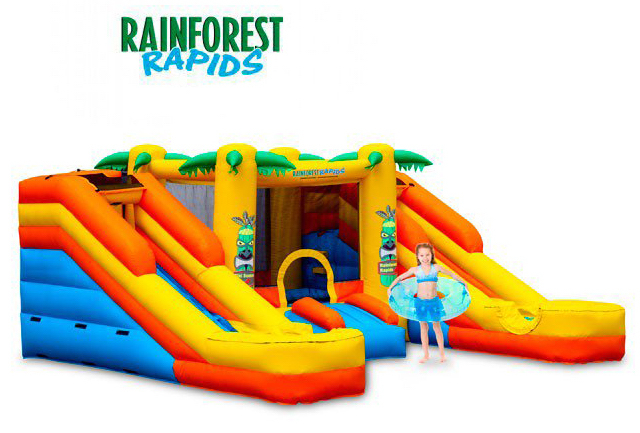 The Rainforest Rapids can be used WET or DRY, for year-round partying! Our inflatables use a constant flow of air, fed from the 1.5 HP blower. As air is pumped in, some escapes through the seams in the material; this creates a stronger inflatable with ideal air pressure, so the bouncer or water slide supports as much playing as your kids want to do. Escaping air is all a part of the process. Our inflatable water slides include a sprayer system that attaches to a garden hose. For safety, a flow restrictor reduces water use, and the sprayers only require a minimal amount of water to maintain flow on the slides. Players should never slide head first and should always limit sliding to one person at a time. In order to ensure that everyone is playing safely, adult supervision is required. Our inflatables are up and ready for play in a matter of minutes - with most taking less than 2 minutes to inflate. We simply unfold a tarp, unroll the inflatable, hook the inflation tube to the blower, stake it down, turn the blower on, and clean/disinfect the unit before each use. We take pride in knowing that our manufacture produces the highest quality inflatables in the industry. In addition, they are assembled quadruple heavy-duty stitching. We take your children's safety very seriously - by providing fully enclosed bouncers with safety netting and climbing surfaces with plenty of foot holes and safety handles we are confident that your children or guests will enjoy the safe and fun experience. During the summertime, an inflatable water slide adds interactive play to any backyard celebration. Inflatable water slides are an excellent way to beat the summer heat and keep your guests cool and entertained. Not only are they perfect for parties, inflatable slides can also be easily used in between holidays and family functions.